Grapevine Heritage AMBUCS is dedicated to creating mobility and independence for individuals with disabilities. We use our National AMBUCS, Inc motto, “SHOULDERS TOGETHER”, to work as a team in support of our community, those in need, and to make a difference since 1991. 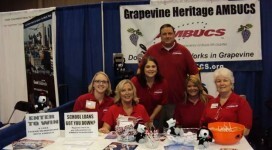 Grapevine Heritage Chapter was sparkplugged by Grapevine AMBUCS in 1991 to provide a chapter where women could actively participate in the organization. Subsequently, the chapter voted to open membership to men and women in order to promote a diverse club that is open to all looking to participate in community service. Our members are passionate about raising funds, giving back to our community, supporting Grapevine, and having fun through fellowship!